Perfection. An Estate that is exciting & welcoming. Amazing Strip, City & Mtn views, elevated golf course lot.Quality finishes & details.This home is a true blend of European influences w/a bit of modern edge. Indoor/outdoor living at its best w/disappearing pocket doors, game rm, exercise rm, temp. controlled 3,000 bottle wine cellar/theater rm/libr/study. 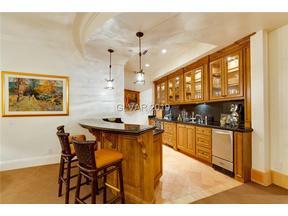 Outdoor kitchen & entertaining areas, elevator, casita, lush landscape, 4car cooled garage.